George | Portuguese Water Dog in Calgary. 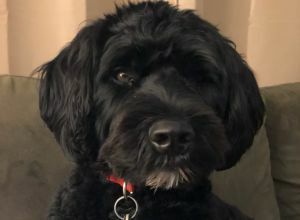 George is an energetic Portuguese Water Dog who loves going for walks and to the dog park. He is very social and loves being around people and playing with other dogs. He is fairly obedient but due to his young age he gets excited easily and then doesn’t listen as well as he should. But on the whole he is very well behaved and responds well when treats are used as a reward. I decided to join the community to get some help exercising my Porty! He could be out walking and playing all day given the option.